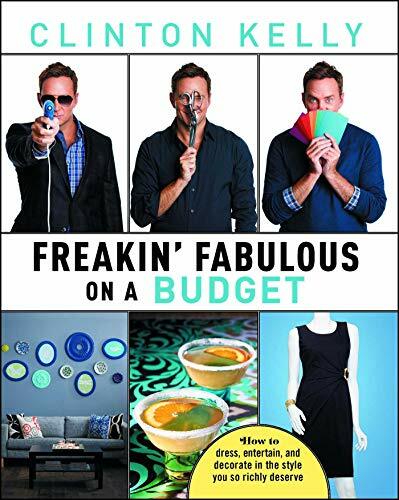 The style guru and author of "Freakin' Fabulous" shows you how to have it all--haute fashion, food and decor--at bargain-basement prices. As co-host of TLC's popular "What Not to Wear" and ABC's "The Chew," Clinton Kelly is constantly helping his guests look and feel their best. Now he's going to share his secrets for making every part of "your" life more fabulous--whether you want to make over your wardrobe, add glamour to your next soiree, or brighten up that dingy bathroom--even if there's no room in your budget. After all, Freakin' Fabulous doesn't have to come at a price--if you have Clinton in your corner. Filled with pages of full-color photography, helpful advice, and numerous ideas for styling, partying, and better living, this book will make you the envy of everyone on the block without emptying your bank account. As Kelly doles out wit and wisdom on everything from thrift store sprees to proper dinner etiquette, he playfully reminds you that you don't need to be a movie star to live like one...as long you shop smartly. Remember, anybody can be fabulous--it's not the size of your funds but how you use them. Clinton Kelly is a television personality, style expert, and entrepreneur. He won an Emmy as a cohost of ABC's daytime hit, The Chew. He also cohosted What Not to Wear, TLC's longest-running primetime reality show, for a decade. Clinton starred in more than 300 episodes of What Not to Wear over the course of ten years, offering honest style advice with a sense of humor. More than one million people watched the popular makeover program every week. Clinton is the author of Freakin' Fabulous; Freakin' Fabulous on a Budge; Oh, No She Didn't; and I Hate Everyone, Except You.